The night itself is great because a great Book (the Quran) was revealed by a great Angel (Jibraeel) to a great Prophet (Mohammed SAW) for a great Nation (the Muslims). It could also mean that a person who spends the night in repentance and worship becomes a great person in the sight of Allah. Qadr can also mean order or destiny. In this case it means that on this night the news of the pre-ordained events for the coming year are handed over to the angels. Thus, news of death, sustenance, Haj, rain, disasters, etc. are all written and handed over to the angels on this night. Allahs Zikr is the best of all speeches. The Masjid is the best of places. Jibraeel is the best of angels. Zamzam is the best of water. Ramadhan is the best of months. Jummah is the best of days. 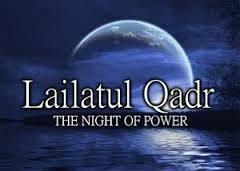 Laylatul Qadr is the best of nights. Any worship done on this night is equivalent in reward to a thousand months (83.3 years) of worship. This one night surpasses the value of 30,000 nights. The Quran was revealed on this night. A person who remains awake in worship on this night, with complete hope and faith of reward, will have all his past sins forgiven. Angels descend with Jibraeel Alaihis Salaam to earth and make dua for any person engaged in Salaah or who is in the rememberance of Allah. The night is peaceful and protected from all evils and calamities. The night is filled with goodness, peace and serenity. No frightening elements like thunder, lightning, wind, etc are found on this night. The blessings of this night are not restricted to one portion of the night but stretch from the beginning of the night to the time of Fajr. The Night of Power is one of the best ways in which a person is to achieve all these ideals.